Though more associated with contemporary and traditional kitchens, wood cabinets can equally lend themselves to modern schemes – especially with the ranges of wood finishes available to us now. Always popular, a wood kitchen feels luxurious and can look good in any size space. Yes really! With modern woods like zebrano and walnut and high gloss finishes, the wood kitchen is no longer the reserve of the farmhouse kitchen! See Image Zebrano and Cologne Walnut to see just what we mean! Tobacco and Truffle finishes are also well worth considering if you want a traditional material with a very modern feel – think New York loft apartment (in Wakefield)! 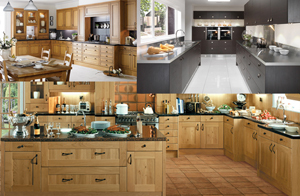 Nothing offsets the best of modern and traditional better than an oak kitchen. Not too dark or too light, it has a timeless quality that translates well in any range. Particular highlights of ours include the shaker style Flaxley Lancaster Oak or you could go lighter in tone with the Cologne Ferrara Oak. Nothing says traditional kitchen better than wood! The Pendle and Heritage ranges in particular show their features and detailing best in oak and they work equally well with colour or neutral décor schemes. You can browse these and other wood kitchens in our Kitchens by Colour gallery. For help planning your kitchen why not book a consultation? 0 Responses to "A closer look at our Kitchens by Colour: Wood"